For those of you who like your rock 'n' roll honest, American and twanged, obligate yourself to going to the CD release party for Mike Dunn & the Kings of New England at BackBooth tonight. They totally hooked me with their recent FMF showcase and the EP is rock-solid. Seriously, the opening song "Paper Candy" is in sickeningly heavy rotation on my player. Their sound is remarkably fleshed-out and fully-formed. Soon to be a major player in the very promising local alt-country scene. And it sure don't hurt that the rest of the bill smolders with hot-blooded acts like Gasoline Heart and the Country Slashers. 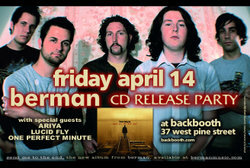 Berman's new album is called Send Me To The End and it hits the streets April 14th at The Backbooth. To be honest, I haven't seen or heard Ariya or One Perfect Minute, so it could go either way for you. Lucid Fly, however, now they will blow your doors off. And they're right nice people too. Should be a fun night. Once again, I'm trying to do too much, but am also going to check out the blues show at Hard Rock Live with Roadblock, Three Fork's Road, Brutha Neil And the Real Deal, and Joe "Survival" Caruso and Hot Band.